This article is about the band. For the band's eponymous album, see 3 Doors Down (album). 3 Doors Down is an American rock band from Escatawpa, Mississippi, that formed in 1996. The band originally consisted of Brad Arnold (lead vocals, drums), Todd Harrell (bass guitar), Matt Roberts (lead guitar), and Chris Henderson (rhythm guitar). The band rose to international fame with their first single, "Kryptonite", which placed in the top three on the Billboard Hot 100 chart. The band then signed with Republic Records and released their debut album, The Better Life, in 2000. The album was the 11th-best-selling album of the year and was certified 6x platinum in the United States. The group was later joined by drummer Richard Liles, who played during the tour for their first album. The band's second album, Away from the Sun (2002), continued the band's success; it debuted at No. 8 on the Billboard 200 chart, went multi-platinum in the U.S. like its predecessor, and spawned the hits "When I'm Gone" and "Here Without You". The band toured extensively for two years. Daniel Adair played drums on tour from 2002 to 2006. This configuration played nearly 1,000 shows across the world following the release of Away from the Sun. In 2005, Greg Upchurch (Puddle of Mudd) joined to play drums to replace Adair. 3 Doors Down released their third album, Seventeen Days in 2005. The album debuted at No. 1 on the Billboard 200 chart and was certified platinum within one month of release. Their fourth album, 3 Doors Down (2008), also debuted at No. 1 on the Billboard 200 chart. The band's fifth studio album, Time of My Life (2011) debuted at No. 3 on the charts. Original guitarist Matt Roberts departed in 2012, owing to health issues. He was replaced by Chet Roberts, who was formerly Henderson's guitar tech. Harrell was fired from the band in 2013 after being charged with vehicular homicide, and was replaced by bassist Justin Biltonen. Worldwide, 3 Doors Down has sold more than 20 million albums. The band has shared the stage with artists such as Daughtry, Pop Evil, Red Sun Rising, Black Stone Cherry, Megadeth, Staind, Nickelback, Three Days Grace, Oleander, Alter Bridge, Breaking Benjamin, Seether, Shinedown, Hinder, ZZ Top, Lynyrd Skynyrd, Bob Seger, and Toby Keith. The band originally consisted of Brad Arnold (vocals/drums), Todd Harrell (bass), and Matt Roberts (guitar). The band began to tour outside Escatawpa, and it was during a trip to Foley, Alabama that they came up with their official name. When the three men were walking through the town, they saw a building where some letters had fallen off its sign, and it read "Doors Down". Since at the time they consisted of three people, they added the "3" to create "3 Doors Down". The cover of their 2011 album Time of My Life hints at the original number of band members (3) and current band members (5); the clock on the album cover reads 3:05. A couple of years after performing together, Todd Harrell asked rhythm guitarist Chris Henderson to join the band. They recorded a demo CD of their original songs at Lincoln Recording in Pascagoula, Mississippi. When the band gave the CD to local radio station WCPR-FM they started playing the EP version of "Kryptonite", and it became the No. 1 requested song on the station for over 15 weeks. The station's program director sent the song to manager Phin Daly who in turn showed it to Bill McGathy, his employer at In De Goot Entertainment. They decided to fly the band into New York to perform a showcase at the CBGB music club. Daly told HitQuarters: "Once they got on stage and started playing it was apparent the magic was in the music. So we moved to sign them." 3 Doors Down's success on the radio also led to Republic Records signing the band. 3 Doors Down's first studio album, The Better Life, was released on February 8, 2000 and went on to become the 11th best-selling album of the year, selling over three million copies. It has since been certified 6x platinum, thanks in large part to the international hit singles, "Kryptonite", "Loser", and "Duck and Run". A fourth single, "Be Like That" was re-recorded for the 2001 film American Pie 2, with alternate lyrics for the first 3 lines. This version is known as "The American Pie 2 Edit". Whilst recording the album, Brad Arnold recorded both the vocal and drum parts. However, the band hired drummer Richard Liles for the tour in support of The Better Life so that Arnold could perform at the front of the stage. Liles left in late 2001. The band recorded in 2009 a Christmas song called "Where My Christmas Lives", which was the first Christmas song Brad Arnold had ever written. It was digitally released along with seven acoustic songs on December 8. Six of these acoustic tracks were from the previous self-titled album, and one was an acoustic version of "Where my Christmas Lives". In January, Chris Henderson reported to the Phoenix New Times that their new album would be released sometime in 2014. From the tail end of 2013 into 2014, the band embarked on an acoustic tour entitled "Songs from the Basement" and toured around the United States. In February 2014, Todd Harrell was arrested in Mississippi once again for a DUI. Afterward, the band released a statement that Harrell was permanently out of the band, and that they would continue with Justin Biltonen as his replacement. In June, Chris Henderson announced that the new album would be titled Us and the Night. It was originally set to be released between September and November 2015. In January 2016, the album's release date was finally revealed to be March 11, 2016. The band then went on tour around North America and in festivals such as Fort rock and Carolina Rebellion. 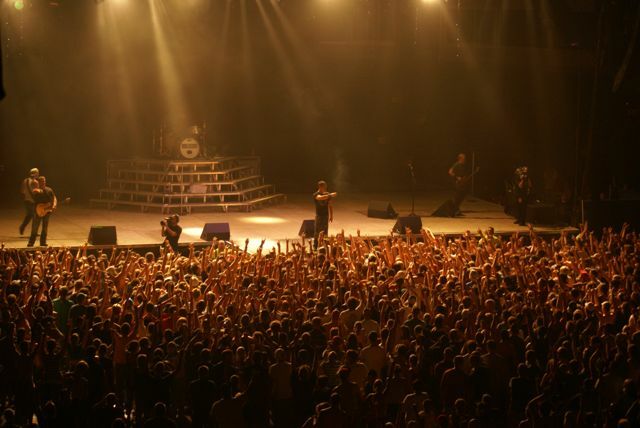 3 Doors Down toured the UK and Europe with a lot of sold out shows. In 2018, 3 Doors Down embarked on the Rock n' Roll Express tour along with Collective Soul and opening acts Soul Asylum. The tour has shows in 36 cities in America. On June 28–29, 2014, 3 Doors Down played both days at Kadena Air Base, Okinawa, Japan. They played all of their greatest hits, and only two new songs. This was at the Americafest celebration. Past performers at the show include Lynyrd Skynyrd, Shinedown, Alter Bridge, Staind, Hinder, Switchfoot, Tracy Lawrence, Sara Evans, and others. Past auction items include a Paul Stanley guitar played on the KISS Farewell Tour, a total of four Roger Bourget motorcycles, access to the Dale Jr. racing suite, NASCAR artwork by Brad Daley, numerous signed guitars and sports memorabilia. ^ a b Proefrock, Stacia. "3 Doors Down". AllMusic. http://www.allmusic.com/artist/3-doors-down-mn0000923323/biography. Retrieved July 1, 2015. ^ Steininger, Adam (August 23, 2013). "The 10 Worst Post-Grunge Bands". LA Weekly. http://www.laweekly.com/music/the-10-worst-post-grunge-bands-4169278. Retrieved July 1, 2015. ^ Ryan, Patrick (July 19, 2013). "3 Doors Down to play U.S. Scouts Jamboree". USA Today. https://www.usatoday.com/story/life/music/2013/07/19/3-doors-down-to-play-us-scouts-jamboree/2569377/. Retrieved July 1, 2015. ^ a b "New 3 Doors Down Material Coming in 2014, Guitarist Chris Henderson Confirms". Ultimate Guitar. January 23, 2014. http://www.ultimate-guitar.com/news/upcoming_releases/new_3_doors_down_material_coming_in_2014_guitarist_chris_henderson_confirms.html. Retrieved May 19, 2014. ^ "Events". Archived from the original on 2016-07-28. https://web.archive.org/web/20160728081700/http://www.3doorsdown.com/. Retrieved 2016-08-19. ^ a b "Interview with Phin Daly". HitQuarters. November 1, 2001. http://www.hitquarters.com/index.php3?page=intrview/opar/intrview_Phin_Daly_Interview.html. Retrieved February 25, 2011. ^ "3 Doors Down Biography". 3doorsdown.com. Archived from the original on July 14, 2009. https://web.archive.org/web/20090714101914/http://www.3doorsdown.com/bio.aspx. Retrieved July 16, 2011. ^ "Music Albums, Top 200 Albums & Music Album Charts". Billboard. December 31, 2009. Archived from the original on September 3, 2011. https://web.archive.org/web/20110903053729/http://www.billboard.com/charts-decade-end/billboard-200-albums?year=2009. Retrieved October 1, 2011. ^ Waddell, Ray (October 16, 2006). "3 Doors Down Plots Benefit, New Album". Billboard. Archived from the original on July 4, 2013. https://web.archive.org/web/20130704033736/http://www.billboard.com/articles/news/56947/3-doors-down-plots-benefit-new-album. Retrieved October 12, 2007. ^ "3 Doors Down Grab Muddy Drummer". TotalRock. Archived from the original on 2007-10-16. https://web.archive.org/web/20071016070053/http://totalrock.com/newsstory.php?id=EEpZluZlZpBUfEcNOsq%3D. Retrieved October 12, 2007. ^ Katie Hasty (May 28, 2008). "3 Doors Down Cruises To No.1 On Album Chart". Archived from the original on May 29, 2008. http://www.billboard.com/articles/news/1045267/3-doors-down-cruises-to-no-1-on-album-chart. Retrieved May 28, 2008. ^ Deborah Evans Price (March 27, 2009). "Jon Bon Jovi, Queen Latifah go gospel for "Day"". Reuters. Archived from the original on May 26, 2011. https://web.archive.org/web/20110526173545/https://www.reuters.com/article/2009/03/27/us-gospel-idUSTRE52Q6WQ20090327. Retrieved April 6, 2009. ^ "Where My Christmas Lives By 3 Doors Down Songfacts". SongFacts. October 28, 2009. Archived from the original on September 18, 2010. http://www.songfacts.com/detail.php?id=17953. ^ ""Every Time You Go" Available May 23!". 3 Doors Down Official Website. January 10, 2011. Archived from the original on May 26, 2011. https://web.archive.org/web/20110526173545/http://www.3doorsdown.com/profiles/blogs/every-time-you-go-available. Retrieved May 22, 2011. ^ "Every Time You Go by 3 Doors Down Chart Summary". music-chart.info. March 28, 2011. Archived from the original on July 19, 2011. https://web.archive.org/web/20110719060331/http://www.music-chart.info/song/697018/Every-Time-You-Go. ^ "3 Doors Down Tour Dates 2011". SongKick. July 17, 2011. Archived from the original on October 31, 2012. http://www.songkick.com/artists/335962-3-doors-down. ^ "Gang of Outlaws Tour Announced Starring ZZ Top...". ZZ Top Official Website. March 26, 2012. Archived from the original on April 24, 2012. https://web.archive.org/web/20120424094214/http://www.zztop.com/news/67891. Retrieved April 7, 2012. ^ "Matt Roberts Leaves 3 Doors Down". May 23, 2012. Archived from the original on May 25, 2012. https://web.archive.org/web/20120525221158/http://www.3doorsdown.com/news/matt-roberts-leaves-3-doors-down/. Retrieved May 23, 2012. ^ Chad Childers (October 5, 2012). "3 Doors Down to Unleash 'Greatest Hits' Collection with Three New Songs". Archived from the original on November 29, 2012. http://loudwire.com/3-doors-down-greatest-hits-collection-three-new-songs/. Retrieved October 6, 2012. ^ "2012 Republican National Convention, Order of Business" (PDF). August 2012. Archived from the original on August 29, 2012. https://web.archive.org/web/20120829214211/http://www.gopconvention2012.com/wp-content/uploads/2012/08/Temp-Order-of-Business1.pdf. Retrieved August 29, 2012. ^ Sanders, Forrest (December 18, 2015). "Former 3 Doors Down bassist sentenced in vehicular homicide case". WSMV-TV. http://www.wsmv.com/story/30789363/former-3-doors-down-bassist-sentenced-in-vehicular-homicide-case. ^ "The Campaign 1984" (in en). https://www.discogs.com/artist/6005333-The-Campaign-1984. ^ "3 Doors Down Reveal 'Us and the Night' Album Title". http://loudwire.com/3-doors-down-chris-henderson-reveals-us-and-the-night-album-title/. Retrieved 2016-01-12. ^ Chad Childers (January 7, 2016). "3 Doors Down Reveal 'Us and the Night' Album Release Date + Artwork". http://loudwire.com/3-doors-down-reveal-us-and-the-night-album-release-date-artwork. Retrieved January 7, 2016. ^ "'3 Doors Down' Ex-Guitarist Dead at 38". TMZ. August 20, 2016. http://www.tmz.com/2016/08/20/3-doors-down-guitarist-dead-overdose-matt-roberts/. ^ "3 Doors Down To Release New Single". TuneLab. January 28, 2010. Archived from the original on January 26, 2011. http://tunelab.com/2010/01/28/3-doors-down-to-release-new-single. Retrieved July 16, 2011. ^ "Artists of the Decade Music Chart". Archived from the original on December 11, 2010. https://web.archive.org/web/20101211143220/http://www.billboard.com/charts-decade-end/artists-of-the-decade?year=2009. Retrieved July 23, 2012. ^ Hecker, James. "AmericaFest". Archived from the original on July 14, 2014. https://web.archive.org/web/20140714205409/http://www.kadena.af.mil/americafest2014.asp. Retrieved June 30, 2014. ^ Melas, Chloe (January 13, 2017). "Toby Keith, 3 Doors Down among acts announced for Trump inauguration concert". CNN. http://www.cnn.com/2017/01/13/entertainment/inauguration-concert-lineup-toby-keith-3-doors-down-donald-trump/. Retrieved January 13, 2017. ^ Schonfield, Zach (January 14, 2017). "3 Doors Down Fans on How They Feel About the Band Playing Trump's Inauguration". Newsweek. Archived from the original on March 7, 2017. https://archive.is/20170307224212/http://europe.newsweek.com/3-doors-down-donald-trump-inauguration-performers-542751?rm=eu. ^ WKRG Staff (January 19, 2017). "3 Doors Down Ignores Criticism For Playing Trump Inauguration". WKRG-TV. Archived from the original on March 7, 2017. https://archive.is/20170307224346/http://wkrg.com/2017/01/19/3-doors-down-ignores-criticism-for-playing-trump-inauguration/?shared=email&msg=fail. Retrieved March 7, 2017. ^ Threadgill, Jacob (January 18, 2007). "3 Doors Down not shying from Trump inauguration". USA Today. Archived from the original on January 25, 2017. https://archive.is/20170125053140/http://www.usatoday.com/story/life/nation-now/2017/01/18/3-doors-down-trump-inauguration/96744996/. ^ Guan, Frank (January 19, 2017). "3 Doors Down Is the Perfect Band to Play Trump's Inauguration". Vulture. Archived from the original on March 7, 2017. https://archive.is/20170307223949/http://www.vulture.com/2017/01/3-doors-down-belongs-at-trumps-inauguration.html. ^ Caulfield, Keith (January 26, 2017). "Billboard 200 Chart Moves: 3 Doors Down & Toby Keith Return After Trump Inauguration Concert". Billboard. http://www.billboard.com/articles/columns/chart-beat/7669825/billboard-200-chart-moves-3-doors-down-toby-keith-trump. Retrieved March 11, 2017. ^ "10 Great Rock-Related Charities To Support". http://loudwire.com/rock-related-charities/. Retrieved 2016-01-12. ^ "The Better Life Foundation". August 23, 2010. Archived from the original on November 6, 2010. https://web.archive.org/web/20101106030101/http://www.3doorsdown.com/profiles/blogs/the-better-life-foundation-7th. Retrieved March 31, 2011.